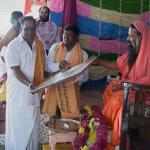 His Holiness Sri Ganapathi Sachchidananda Swamiji visited the 13th Datta Kshetram in Gandigunta Village. 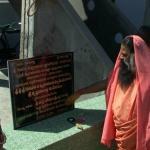 Arriving at 9.30 AM, Sri Swamiji consecrated Navagraha Temple in the Ashrama. 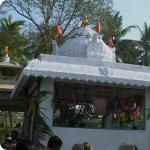 Prior to this, Poornahuti was offered for Shani Homa and Navagraha Pratishtha Homa in the new Yaga Shala. Pratishtha rituals were conducted by Sri Ganesh Prasad Avadhani of Datta Peetham and Sri Sambasiva Rao of Akiveedu Ashrama. A new block of cottages, built by Sri Venkataratnam in memory of his father Late Sri Dandamoodi Krishna Moorty was inaugurated. 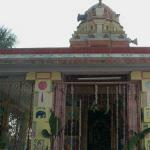 The block was named as Sri Krishna Murty Kuteeram. Sri Swamiji remembered the services of late Sri Krishna Murty, who was very actively involved in the administration of Vijayawada Ashrama. 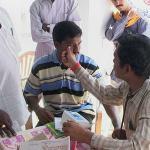 With blessing of His Holiness Sri Ganapathi Sachchidananda Swamiji, SGSGBS Trust,Gandigunta Hosts Free eye checkup camp.